Since it's the season of graduation, I'll share a photo of a Halloween party where my costume was a graduation gown that I borrowed from the school and a sign that said, "I are a graduate." Wow, look at those big glasses! 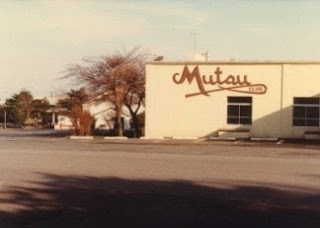 Davy Jones' Locker was a bar in the basement of the Mutsu Officer's Club and a favorite place to hang-out on base. I remember watching the episodes of the mini-series Shogun in the bar. The pilots would bring the tapes of the previous night's episode, and a crowd would gather to watch. Do you remember watching the Shogun mini-series in the 1980s? 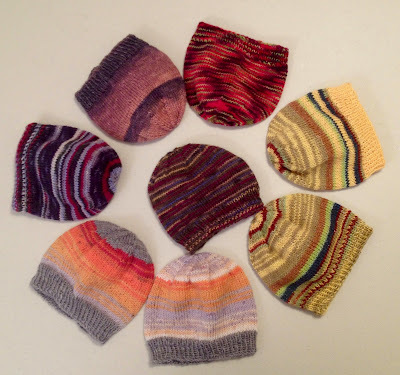 The sock yarn scraps are nearly gone, thanks to these eight baby hats as well as these hats that were finished and posted last month. Where do I begin? LeRoy (aka Captain America) was a colleague for many years, but he was also a teacher of mine when I was a senior. My senior business teacher died mid-year, and LeRoy, a teacher at a rival school (Morton High School), was asked to teach some of her classes (probably during his planning period). My school, Pavillion and Morton were scheduled to consolidate the following year to form Wind River. 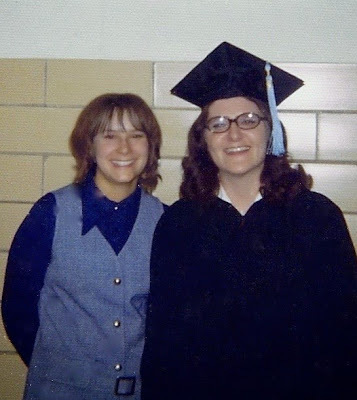 I returned approximately twelve years later, as an English (Language Arts) teacher at Wind River. LeRoy was a jokester and through the years, he dished out as much as he received. 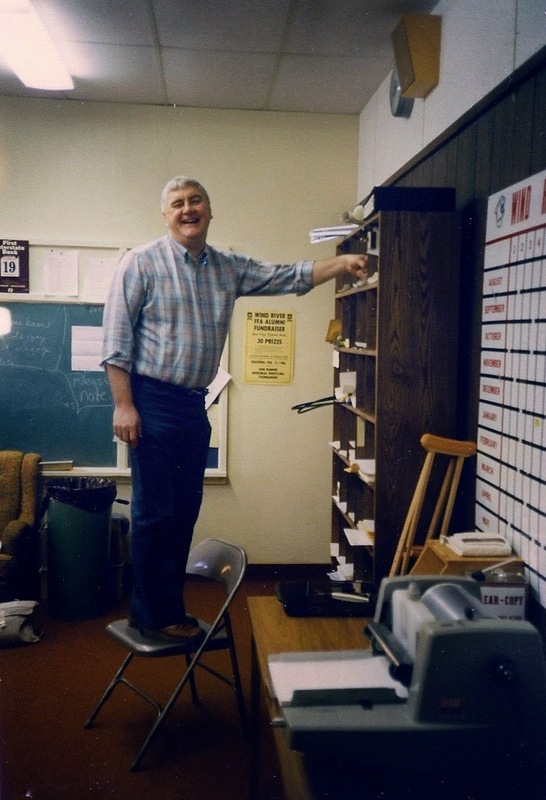 One April Fool's Day, several of the teachers slipped into LeRoy's room and removed ALL the typewriters, opened the windows and waited for LeRoy to discover his room had been robbed. Some of the men unhooked a trailer from behind his vehicle and hid it. They had informed the Sheriff's deputy beforehand, so the "joke" extended beyond the school. Principal Bob B. presents LeRoy with a "door prize"
The consolidated school consisted of two campuses some twelve miles apart for many years: high school near Kinnear; middle school/elementary in Pavillion. The high school parent teacher conferences were usually held in the middle school/elementary gymnasium in Pavillion. 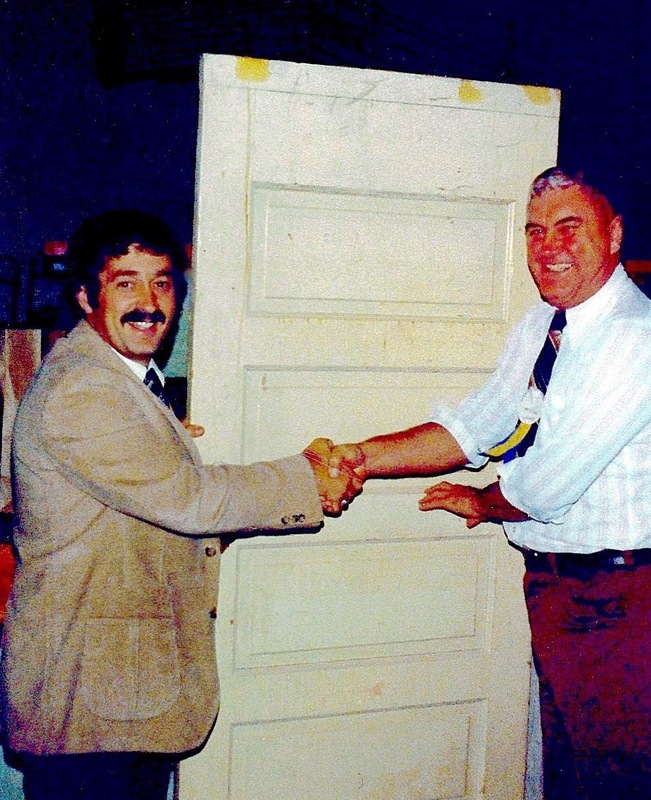 I can't remember the circumstances, but one year during conferences, the principal presented LeRoy with a "Door Prize," an actual door that was stored on the stage at the end of the gymnasium. LeRoy hosted a "Dating Service" every year as prom approached, and the students loved it. His track teams could share many memorable times, too. The school's track and field bears his name, and he was named to the Wyoming Coaches' Hall of Fame. For several decades, the Wind River staff remained fairly constant, and only the principals changed. Friendships and a camaraderie was established that benefited not only the staff but also the entire district and the students. Personally, I think LeRoy played a large role in that atmosphere. 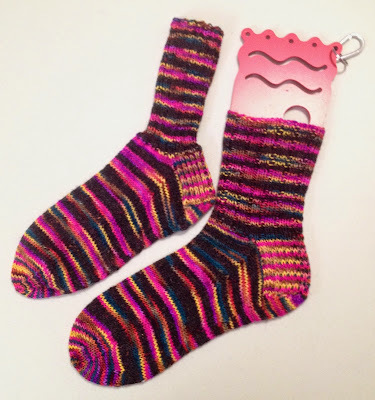 I first posted these socks in March when I reviewed the Sock Rocket needles. The yarn came from Katherine (I think) in a swap hosted by Kathyb. It's the first time, I've ever knit with yarn that contained Seacell: it is a bit coarse to knit and split a bit, but I think it will wear like iron. I tried several projects (a cowl, a hat, a shawl) with this yarn before deciding to knit the Plain Jane socks, and I have enough remaining to make another pair. The Ocean color way is a vibrant and over-powering, so I paired it with the tweed to tone it down a bit. 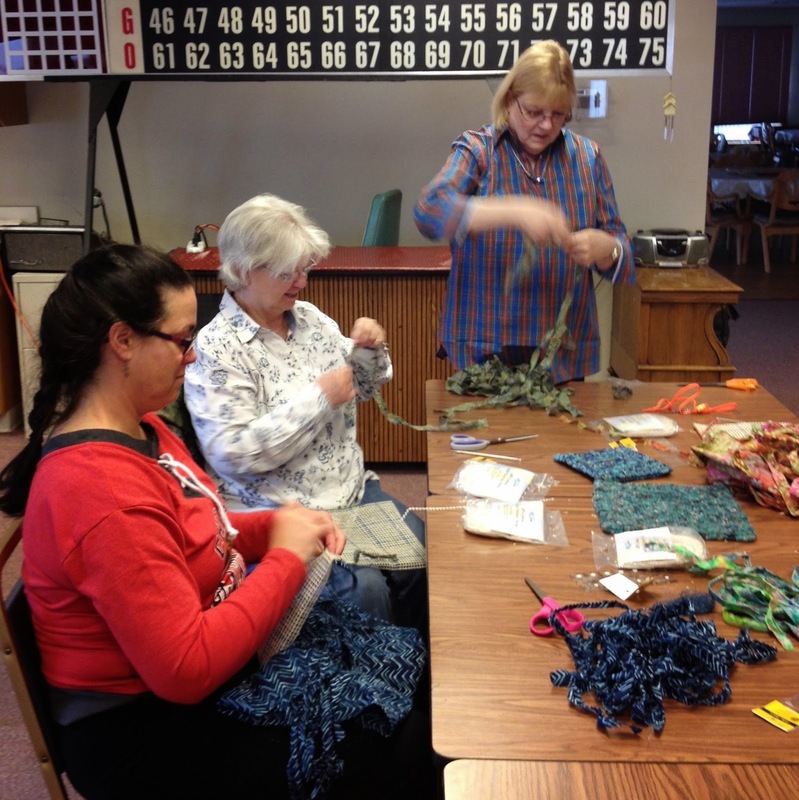 Recently, the Fremont County Fiber Arts Guild hosted its annual retreat in Lander. 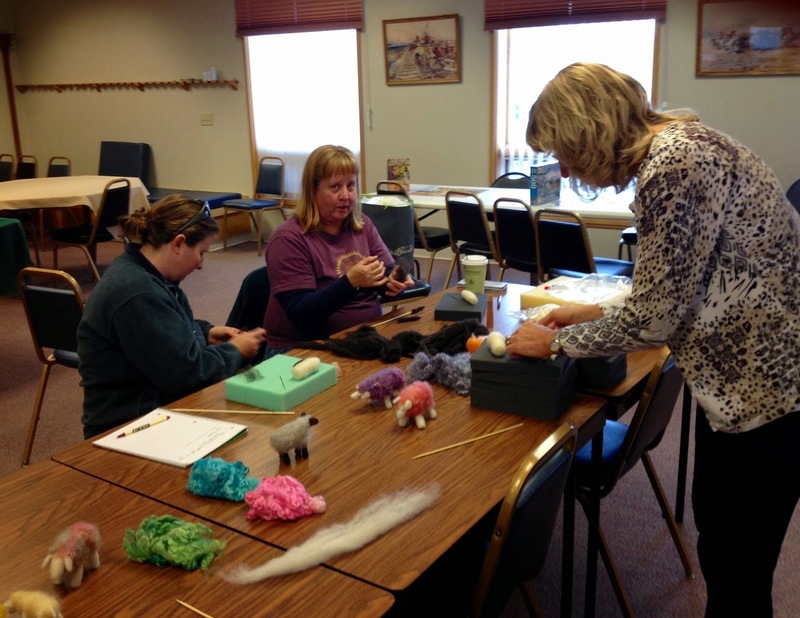 Three classes were held: Locker Hooking, Needle-felted sheep, and Needle-felted knitting gnome. I took the Locker Hooking class, taught by Mary H., who also taught the Beginning Crochet class that I took at the 2014 retreat. For a minimal supplies fee, I received the canvas, a yard of fabric, and the locker hooking needle. 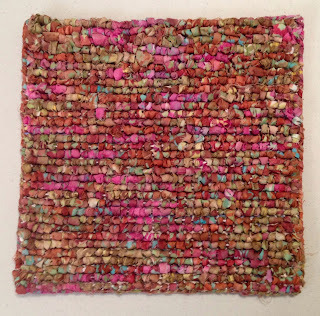 I finished the mat at home in a couple of nights. 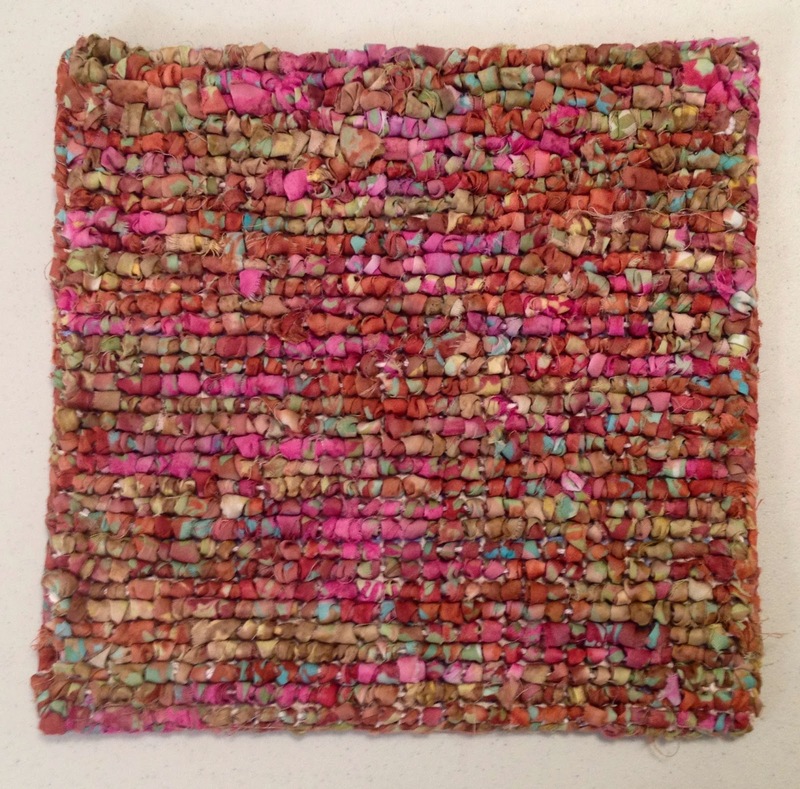 I love the technique and plan to make some other mats from scrap materials. Thank you, Mary for being such a great instructor. The two Needle-felting classes were taught by Nancy J. who posted about the classes on her blog High Plains Footprints. 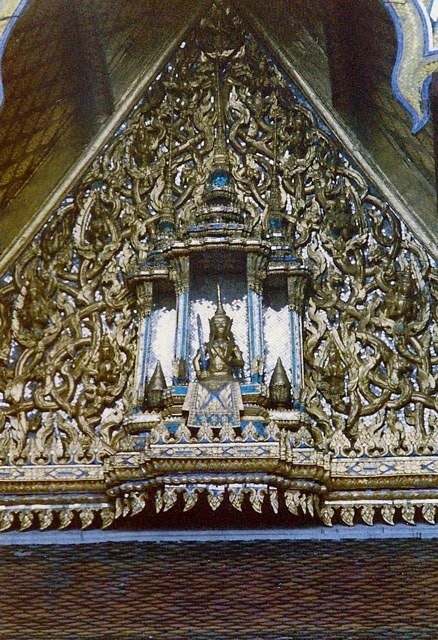 Other Bangkok temple photos can be seen here. Sue stopped by my house a couple of weeks ago, bearing gifts: some fabric and two kits. The kit, shown above, is for a full-sized quilt - complete with backing fabric. It will soon become a Quilt of Valor. She also brought some red yardage (sorry, no photo) - approximately six yards that I'll use for a Quilt of Valor backing and some presentation cases. This kit included the pattern (appliqué) for the eagle. 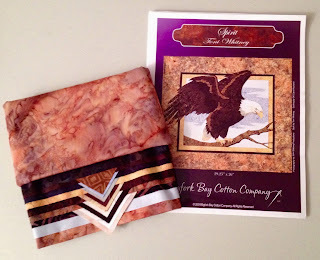 While it is beautiful, I told Sue that I would not be making the eagle, but would use the fabric for other Quilt of Valor projects, and she was fine with that idea. 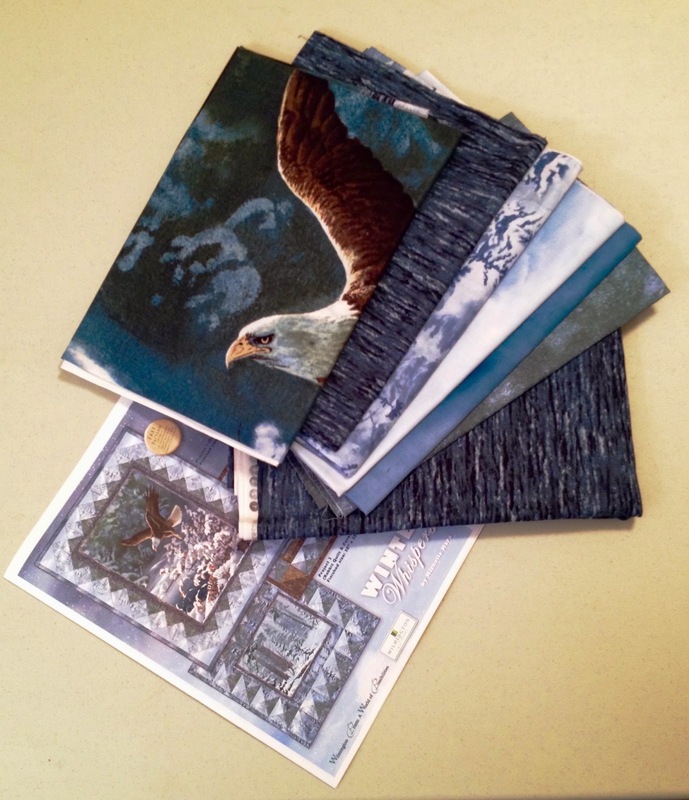 I would like to offer the Eagle appliqué pattern to someone who would actually make it. It is 29.5 x 26 inches. 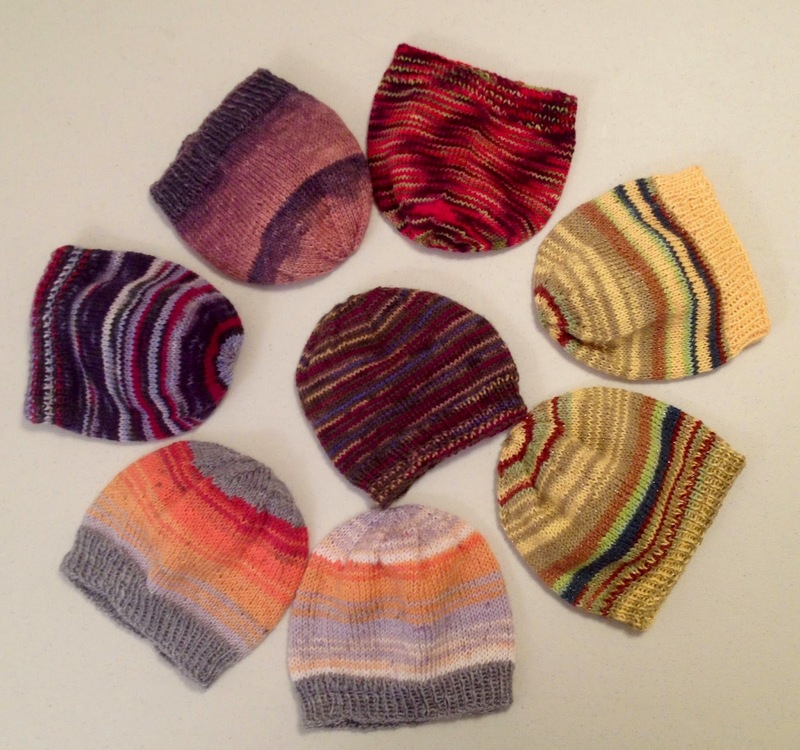 If more than one person expresses an interest in the pattern, the names will be placed in a hat and the winner selected on May 26, 2015. Thank you, Sue for sharing your kits for Quilts of Valor. 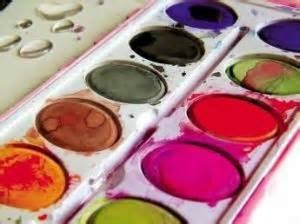 Paintbox was partially created by some Quilt of Valor elves, members of the Lander Sew Sistas (see this earlier post) and named for the paintboxes we all had as kids. 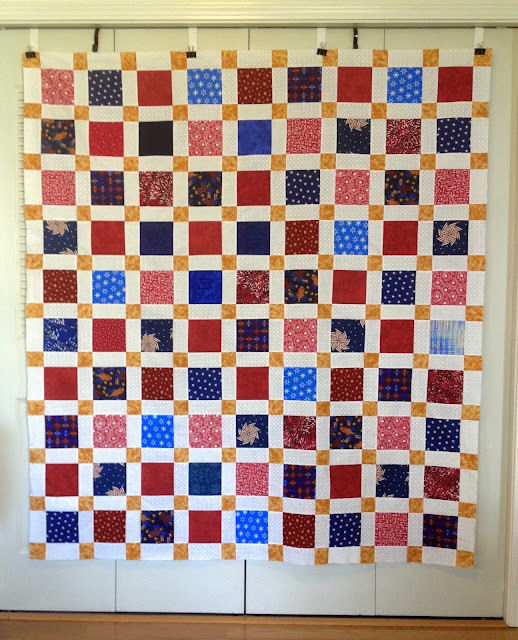 This is Quilt of Valor #65 - a list of completed QOV can be see here. 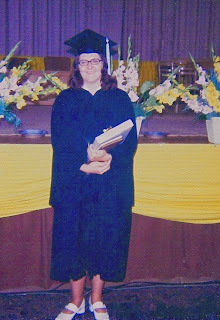 I recently found the photos of my graduation from the University of Wyoming: BA in Education with a double major - Language Arts and Theater. Was I really ever that young and with dark hair? 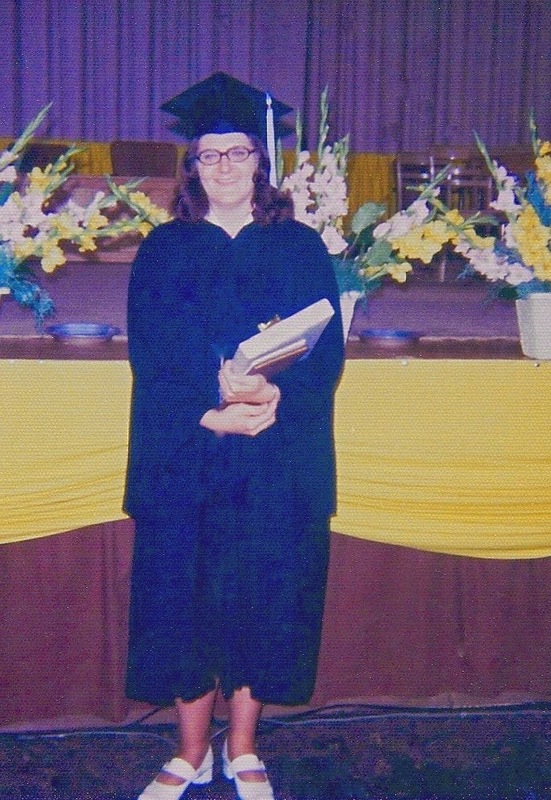 Mom came to Laramie, WY for the ceremony, held in the UW Field House. Since I was the only one in my immediate family to attend college, this was a special occasion for her and for me. Charlotte T. and Nancy S.
Charlotte (aka Charlie) and her sister Ruth were my roommates the last year and a half at the UW. 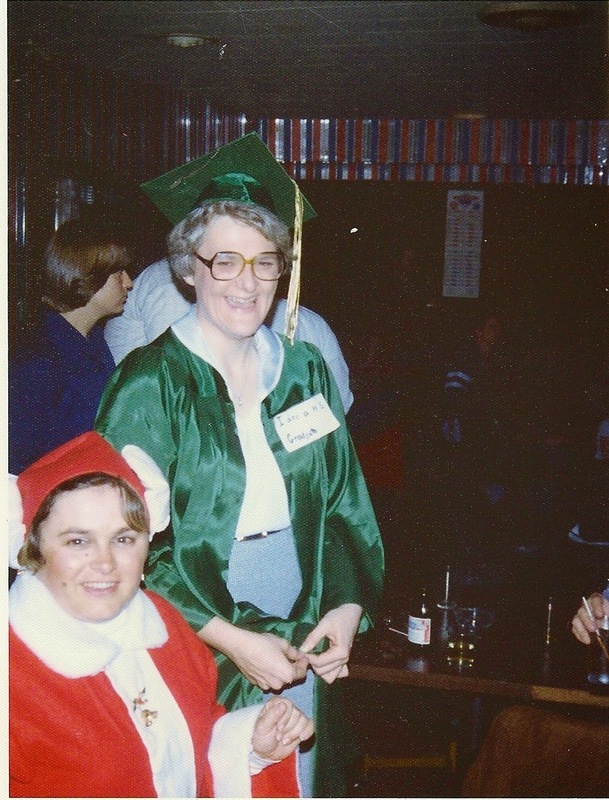 Charlie was a lot of fun and petite: note my height in the photo with my Mom and the one with Charlie. The first year that we roomed together, our apartment was near "Stink Lake" about a mile north of campus. The "lake" had some sort of algae that smelled disgusting in the spring. The summer I graduated, Charlie, Ruth and I lived in a small house across the street from the UW Classroom Building; thus, a much shorter walk to classes. That summer, I lived in the attic of the little house and enjoyed the isolation, as it gave me a perfect place to practice my lines for the Summer Theater productions. After graduation, Mom and I drove to Wheatland, WY to look for an apartment, as I would begin teaching Language Arts, Drama, and Forensics in Wheatland that August. 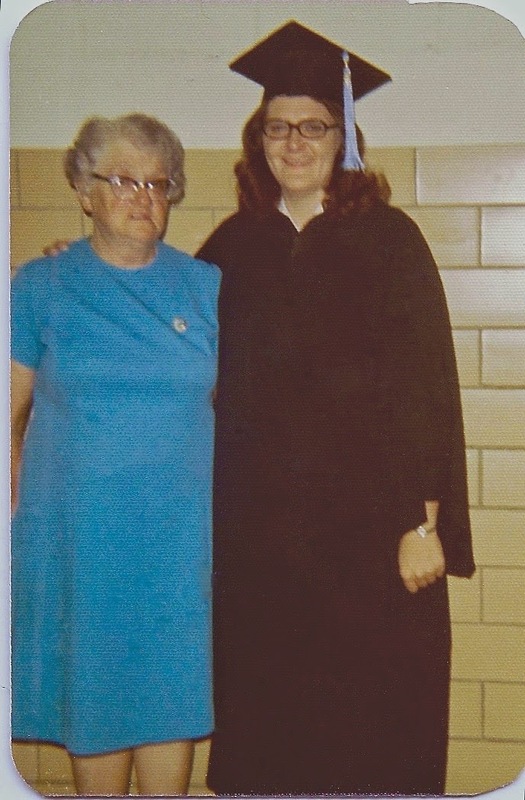 The apartment I found was in the basement of an elderly lady's house, and I lived there a year, but I taught in Wheatland for six years and lived in two apartments, a house, and a house trailer. Brenda H., Nancy L. and Mary H.
Mary (in the purple shirt), coordinates a group of ladies who meet at the Lander library each month to sew, craft, or try new techniques. Previous posts about this group are here and here. When the group's May project was cancelled, I asked Mary if they would be interested in making QOV blocks. She happily accepted my offer. The group meets for two hours, so I opted from two quick blocks (a Disappearing Nine Patch and a Rail Fence) from which the ladies could choose to work on that day. From my stash, I selected and prepared fabric strips and squares to take for the group sew-in. 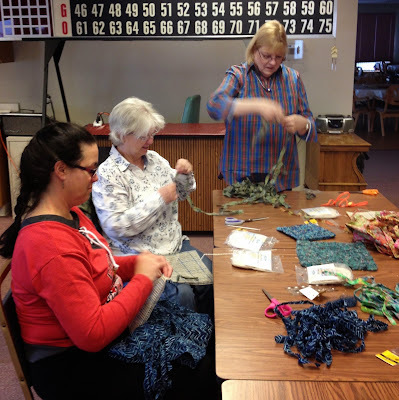 The group numbers change from month to month, and last week three ladies showed up with their sewing machines and an eagerness to make some QOV blocks. Those three QOV eleves sewed enough strip sets to recreate bottom portion of the quilt hanging on the wall, as well as DNP blocks for a good start on a quilt. Nice job, ladies! Photos of the finished quilt tops will be posted soon; hopefully, this week. 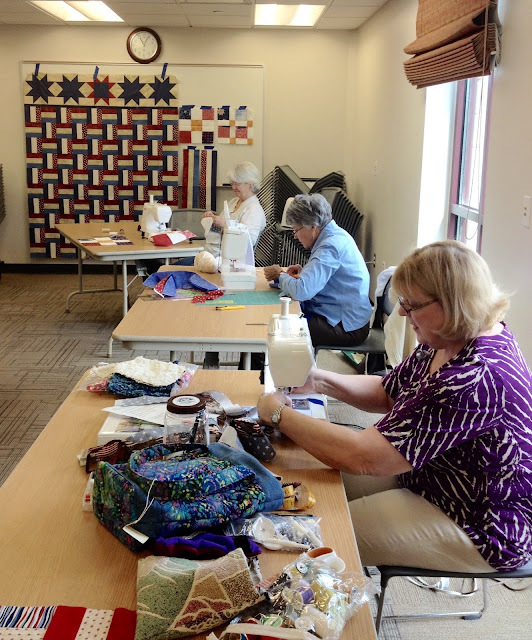 Thank you, Mary, Brenda, and Nancy for making two Quilts of Valor possible. I loved these cutwork vases and was very tempted to purchase one; however, it was not feasible at the time. 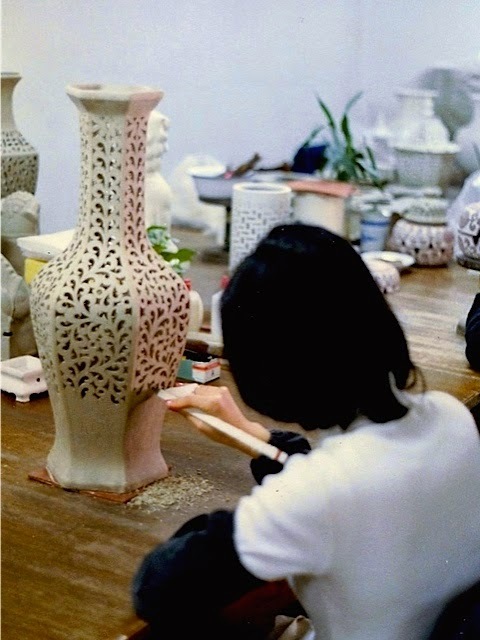 Several earlier posts featured other pottery at the pottery factory. 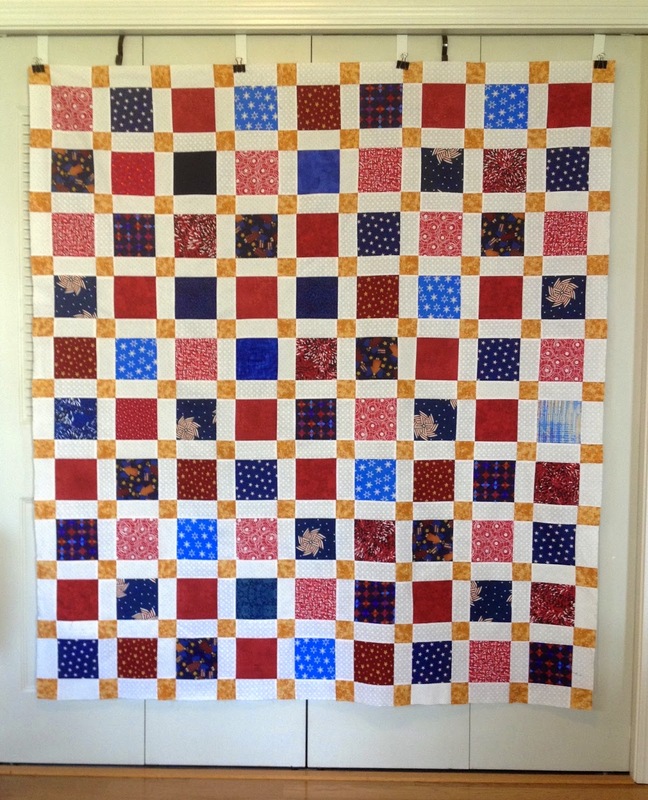 My goal of 64 Quilts of Valor was met last week when I completed this top, made with a kit I picked up at the Quilt of Valor sew-in in March. I had to supplement the kit as the fabric needed for the small star tips was missing. Luckily, I had some tone on tone beige that worked with the other fabrics. Assembling the quilt, I was disappointed that the center star's fabric was so subtle and that the star seems to lose some of its dominance. Yet it was the subtle nature of the star that lead to this quilt's name - Humility. Many veterans that I know are humble and do not like to draw attention to their service, so in a way, the star's lack of dominance represents those unassuming heroes. A complete list of the sixty-four Quilts of Valor and links to the post and photo of each can be seen here. Brenda (my niece) snapped this photo a couple of weeks ago when she was out walking. 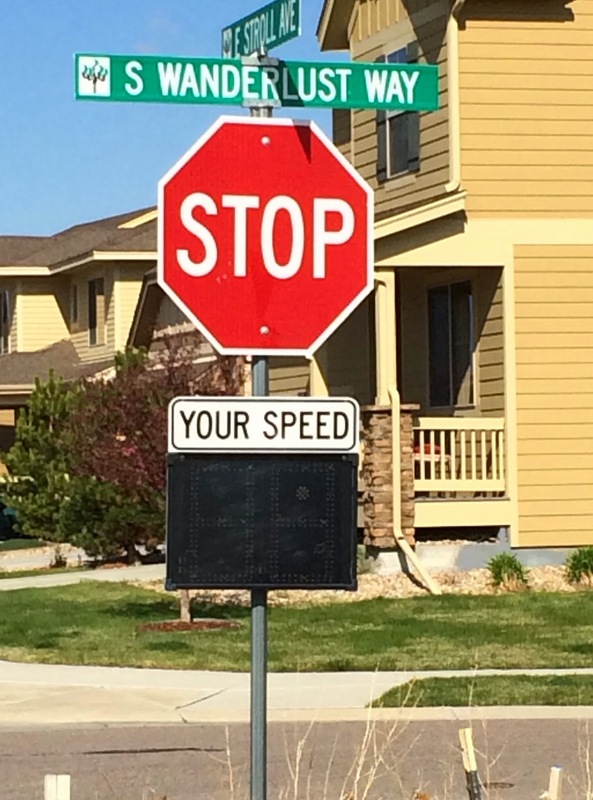 Perhaps you can explain why a radar-controlled speed sign is mounted below this stop sign because Brenda and I are shaking our heads in disbelief. When the Quilts of Valor are returned to me from the volunteer longarm quilter, I add the finishing touches. Sometimes excess backing and/or batting needs to be trimmed before I can begin. I prepare the binding and add a label (I machine sew two sides of the label the same time I sew on the binding). 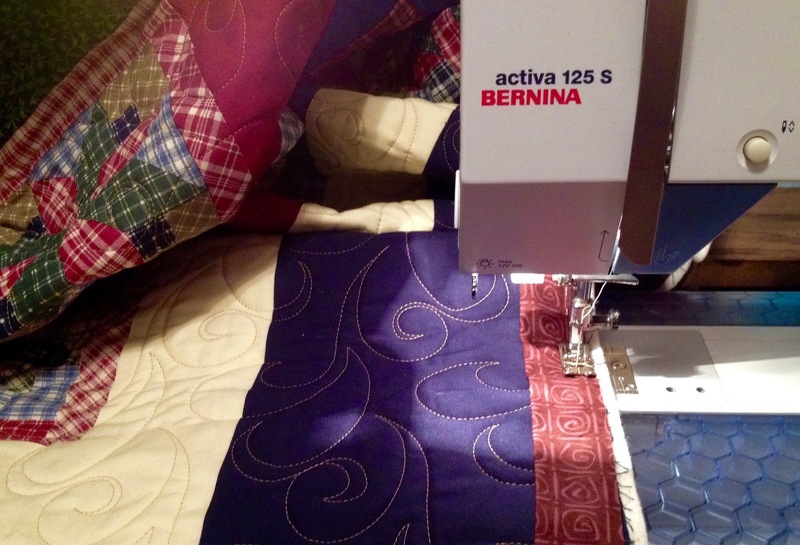 Once the binding has been attached by machine to the front side of the quilt, I turn it to the back and hand-tack it. Once the binding is secured, the quilt is thrown into the washing machine with a color catcher and laundered. Sometimes the color catcher is red and other times it is blue, depending on which color bleeds in the wash. After the rinse cycle, the quilt is tossed in the dryer and comes out clean and wonderfully crinkled. I fold the quilt, add a presentation case and deliver the Quilts of Valor to the Wyoming State QOV coordinator at Sheep Camp Quilt Supply. 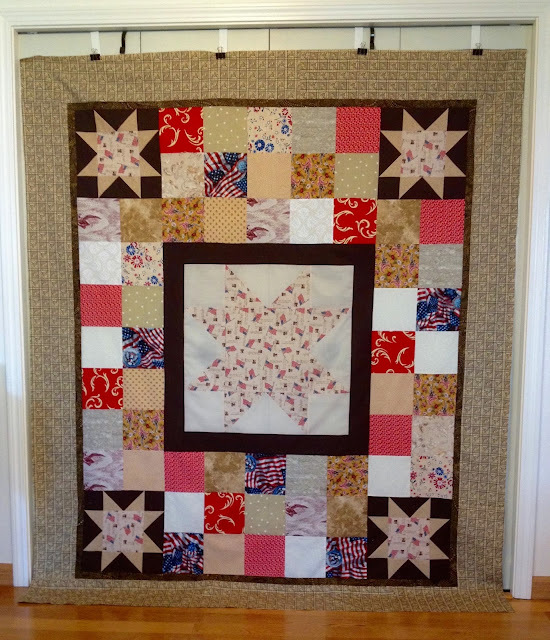 Stars and Stripes came together very quickly from the kit I obtained at the Quilt of Valor Sew-in last month. The only problem I encountered was the kit did not have adequate fabric to finish the stars. The kit was short on the cream fabric needed for the star block corners as well as the the points of one star. I searched my stash and found some cream fabric that was close to the correct color for the corners and decided to make a statement by making bright red points on the center star. 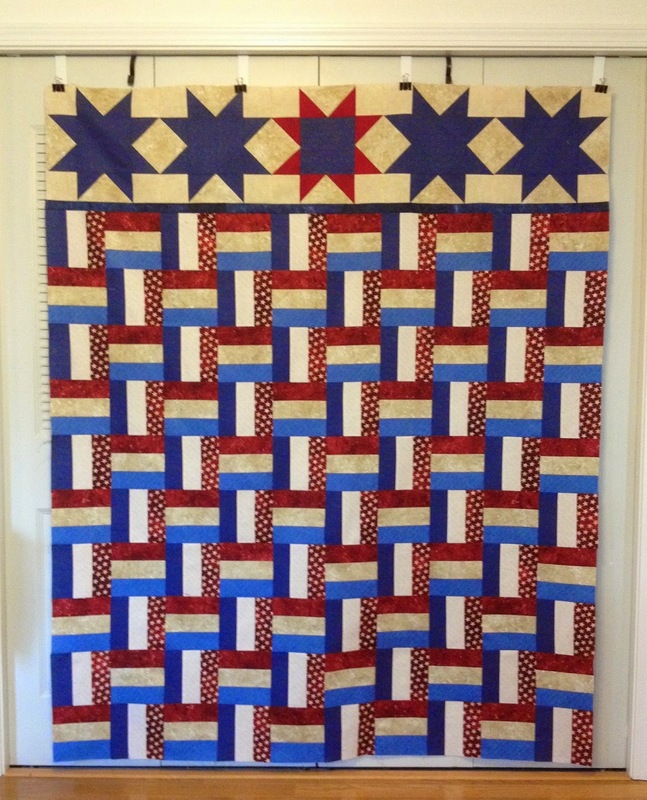 Stars and Stripes is Quilt of Valor #63 - only one more to make to reach my goal. 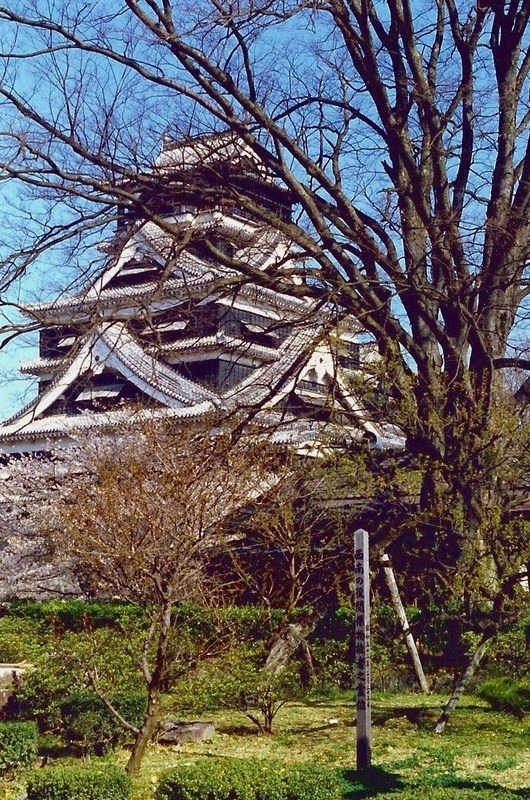 Kumamoto Castle is one of the three largest in Japan. This castle took seven years (1601 - 1608) to complete. The castle is approximately 8 miles in circumference, having a main tower, secondary tower, 49 turrets, 29 castle gates, and numerous other structures. Previous posts on this castle can be seen here. 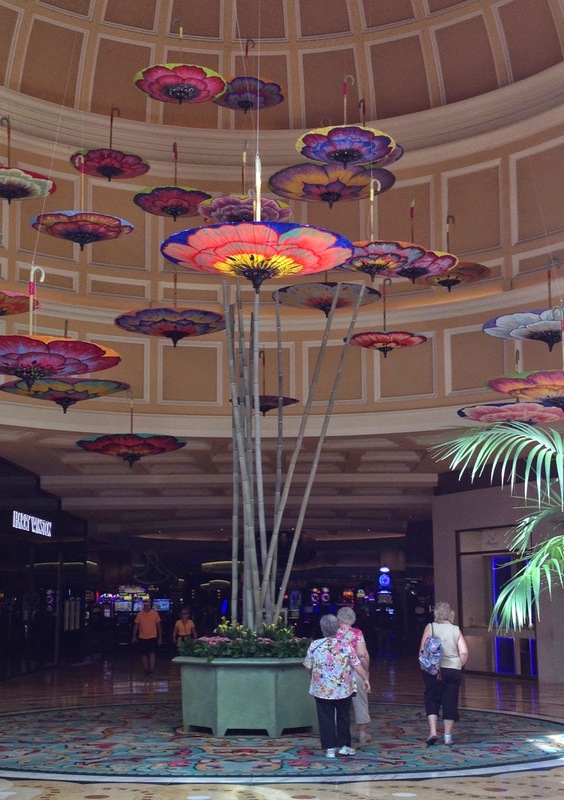 Not only was it wonderful to soak up some warmth and sunshine in Las Vegas, but it was also delightful to see the elaborate springtime displays in the hotel lobbies and corridors. Aren't the Japanese parasols beautiful! 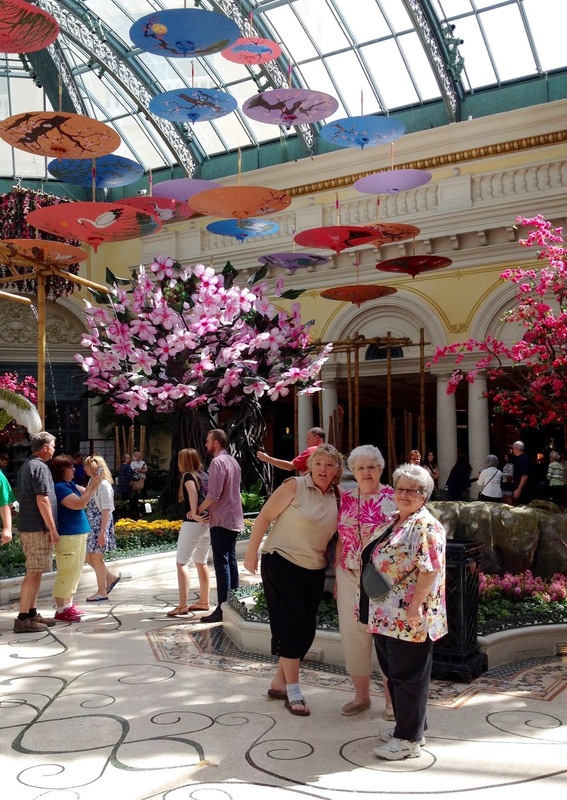 The colorful parasols were on display in the Conservatory and in the corridors of the Bellagio Hotel. 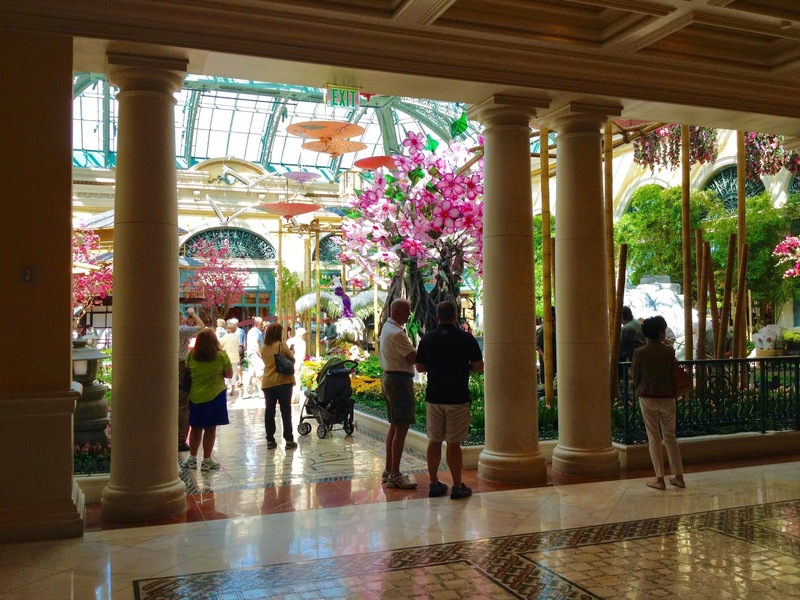 The slot machines, the gambling tables, and the variety shows are NOT the only attractions in Las Vegas. 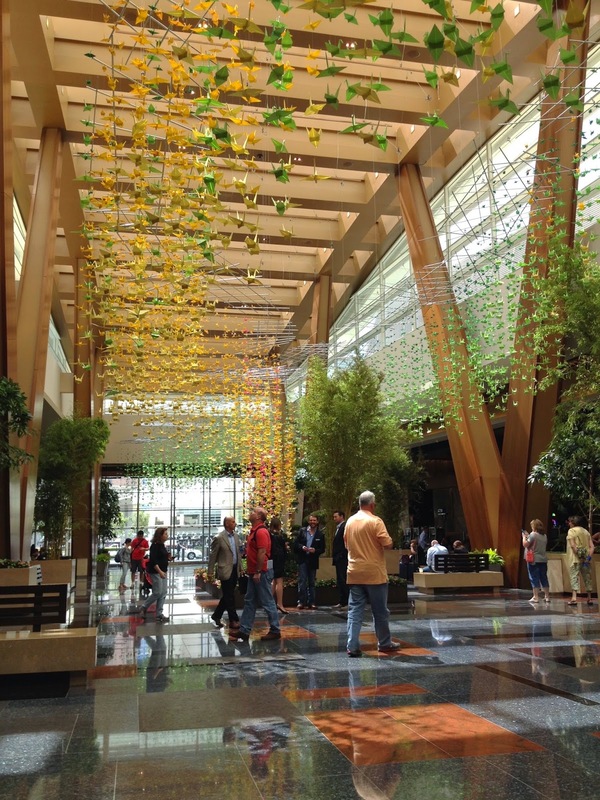 I enjoyed viewing the displays as well as the casinos' exterior and interior architecture. 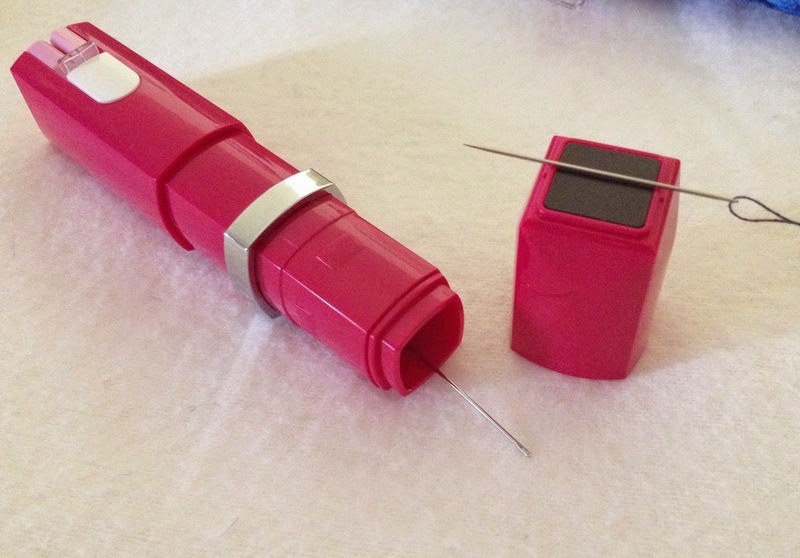 I use this handy needle threader quite a bit whenever I hand-tack the bindings on the Quilts of Valor. The tacking goes quickly with a small needle, but frankly my eyes are no longer good enough to thread the needle unassisted. 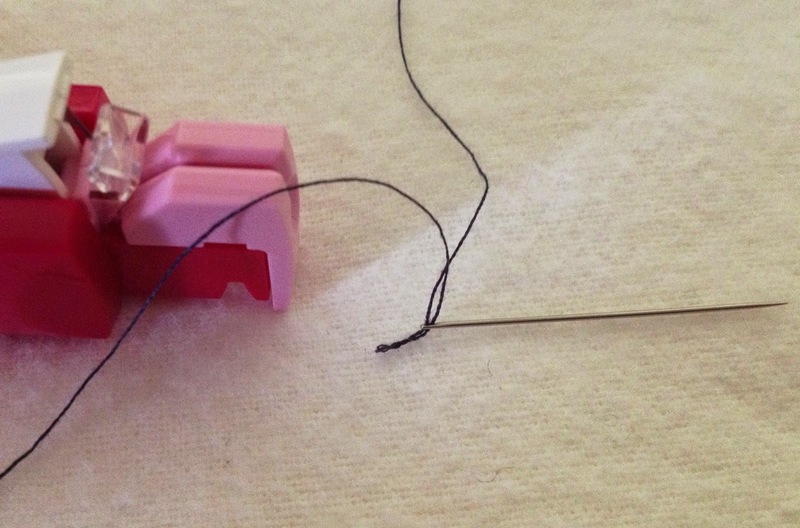 The small needle's eye is even too small for me to use a conventional needle threader. 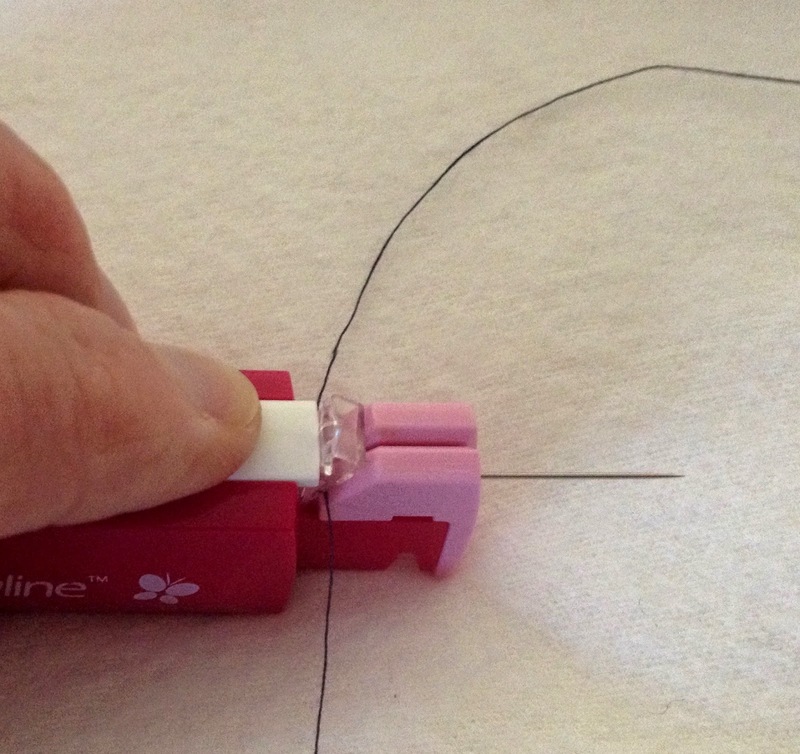 The Sewline website recommends using this tool for size 9 - 12 needles. 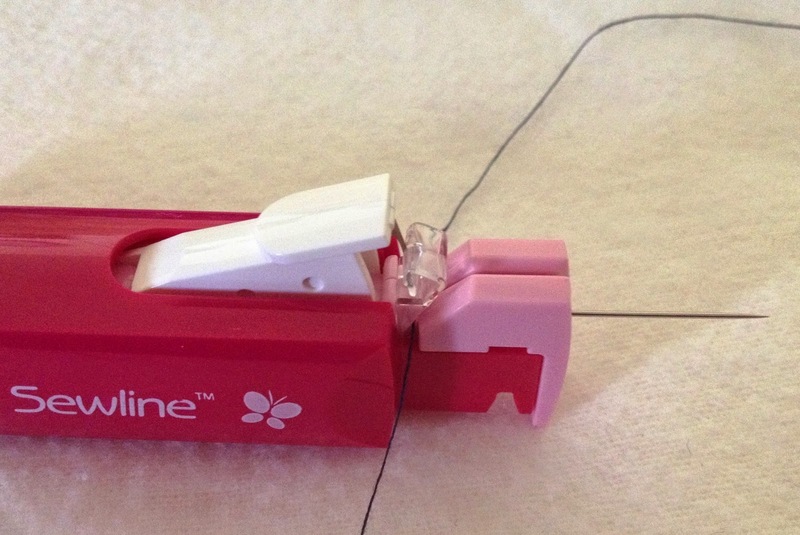 Several years ago, I saw the Sewline threader featured on a blog and did a quick search online and immediately ordered one. 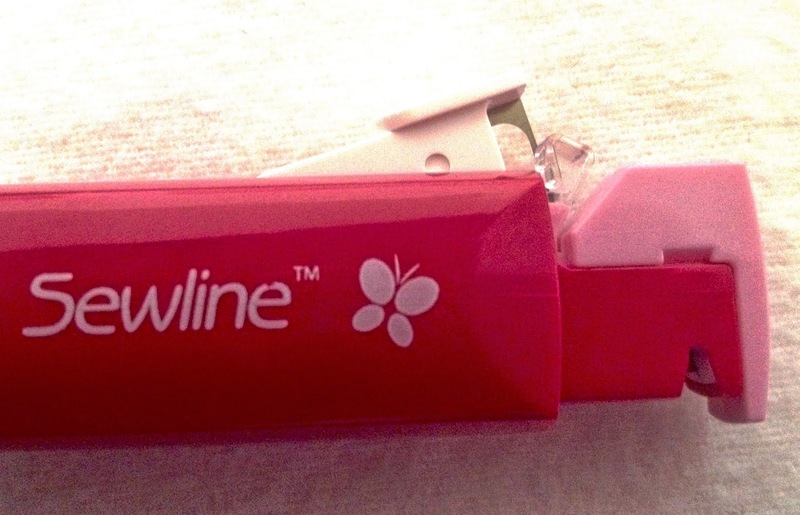 The Sewline is about the size of a lipstick tube. 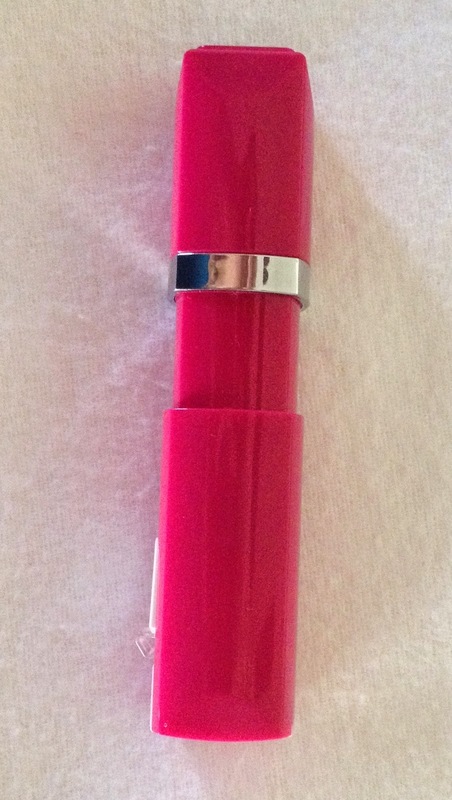 Note the front section slides toward the metal ring to reveal the threader. Close up of the threading mechanism. Note the metal hook-like attachment on the white section and the groove between it and the pink section. The eye-end of the needle is inserted into a hole in the front of the threader, and the thread is placed in the groove. Gently push down on the white section. Do NOT force the threader - if resistance is felt, reposition the needle. Withdraw the needle, and it is magically threaded. Tug on the thread to draw it through the eye of the needle. 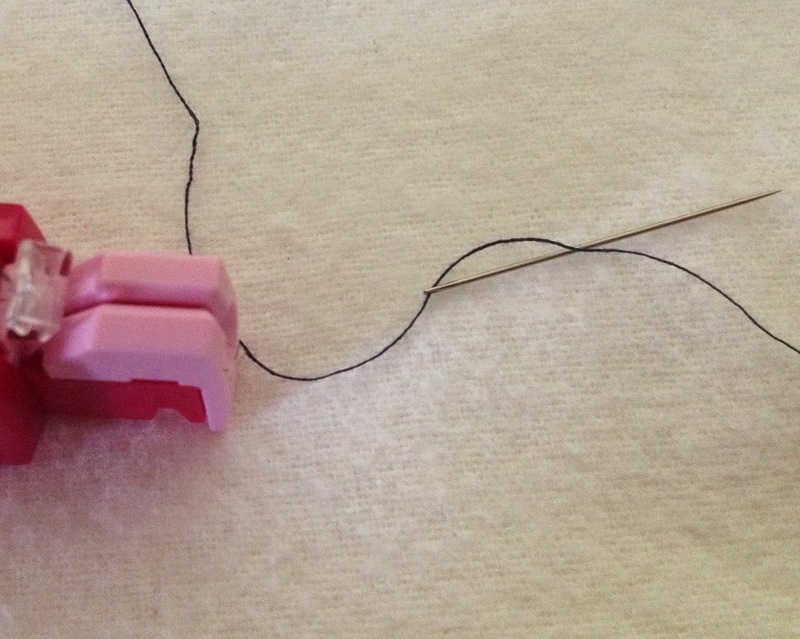 The cap on the other end of the threader has a magnet, and under the cap is a compartment to store extra needles. I love this threader, and anyone who does any kind of needlework will appreciate how quickly and easily it threads a needle. Note: I am a satisfied customer and did not receive any compensation for this post/review. April Showers Bring. . .